With every new season comes players that are chomping at the bit to make the team, or enhance their role. 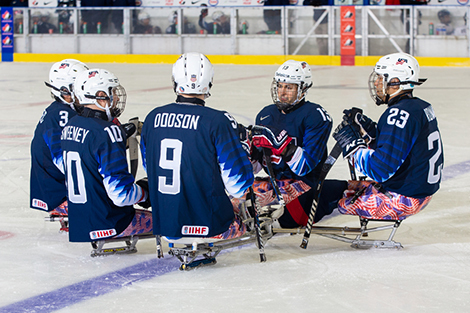 Playing in their first tournament since the 2018 Paralympic Games, the U.S. National Sled Team features three players in the Para Hockey Cup that are making the jump from the U.S. Men’s Development Sled Team, getting their first taste of the National Sled Team in the process. The newcomers are making their mark in London, Ontario. One puck stain on white twine at a time. Kyle Zych of South Hadley, Mass., and Colorado Springs, Co., native Josh Hargis both notched their first goal at the National Sled Team level through two games of the tournament, with the U.S. topping Canada and South Korea, 3-0 and 9-0, respectively. Zych has goals in back-to-back games and was named the U.S. Player of the Game in the win over Canada. His first goal was a special moment both on the ice and in the locker room, where he received his goal puck. The emotions were equally as filling for Hargis, who’s tally opened the scoring in Tuesday’s matchup vs. South Korea. Through two games of the tournament, the U.S. has scored 12 goals without allowing a single tally. They have one game remaining vs. Canada and South Korea each, with the Championship Game slated for Saturday, Dec. 8 at 4pm ET. The Para Hockey Cup roster boasts 12 gold medalists from the 2018 Paralympic Games. While the experience and winning culture is there, and it’s shown so far, it’s a nice boost to see the fresh faces performing admirably. Along with Zych and Hagris, defenseman Colin Gooley is making his debut after spending last season with the U.S. Men’s Development Sled Team. While players hone their crafts throughout the year with their club teams, various training camps with the Men’s Development Sled Team have helped increase the amount of depth in the U.S. Sled hockey programs, with the relationship between the two programs helping smooth the transition once players make the ascent to the National Sled Team. Kyle Zych has found the net in both games he's played with the U.S. National Sled Team so far. Roman, now in his eighth year with the U.S. National Sled Hockey Team has been impressed by the newcomers finding their niche in the first international competition of the new season. Seeing Hargis’ success was increasingly heartwarming for Roman, as the two have been teammates on the club side with both the San Antonio Rampage Sled Team and their current club, the Colorado Avalanche Sled Team. Declan Farmer leads the U.S. in the Para Hockey Cup with four points, while Brody Roybal, Roman and Zych each have three points as the U.S. looks to continue their strong play Thursday, Dec. 6 against Canada.